Stay away from furniture and glass windows, keep yourself low and protect your head from falling objects. Do not rush outside.Falling pieces of glasses and tiles may hit you outside. Open the door of your guest room to secure your evacuation route. Stay there until the shakes are over. Then, follow the instruction of hotel staff. Crouch on the ground and protect your head from falling objects. Stay away from block walls, cliffs, coast, rivers and narrow roads. Run to a nearby open space. Slow down and park your car on the shoulder of the road. Turn off the motor. Turn on the radio for emergency information. Do not lock the doors, with your key inside, when you leave the car. Immediately leave the coastal area and run to a high ground or an upper level of a sturdy building. Ask people around you where to run. Check and see the evacuation route from your hotel room in advance. 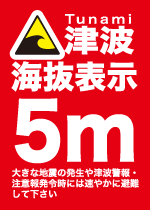 Do not ever approach the sea until the tsunami alert has been completely lifted. At major tourist sites, you find signs to show the elevation from the sea level. Make sure you reach a shelter high enough above sea level, when you are evacuated. Check the elevation of the place when you are visiting a coastal area. In case of evacuation, act promptly and follow the instruction of the hotel staff and local people. Help evacuate someone who is in need of assistance or ask for help to people nearby.